This pattern is a single page with a color photo of the stitched design on the front cover and the pattern, color legend, stitch count and fabric sizes, and basic instructions on the back side. The color legend lists the DMC colors/numbers and symbols. The basic instructions include how to make the bookmark. The finished design can also be framed for mounting on the wall or sitting on a bookshelf. STITCH COUNT: 30 x 120 14-Count: 2-1/8w X 7-1/4h in. 18-Count: 1-5/8w X 5-5/8h in. 20-Count: 1-1/2w x 5h in. When stitched on 14-count Aida cloth, it measures 3” w by 9” h. As with all my designs, I stitched it first so that I could change the colors as needed. 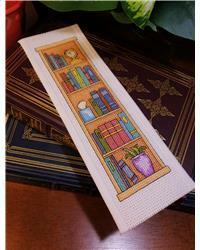 The picture of the finished bookmark in the photos is the one I stitched myself. Project Size: 3" x 9"